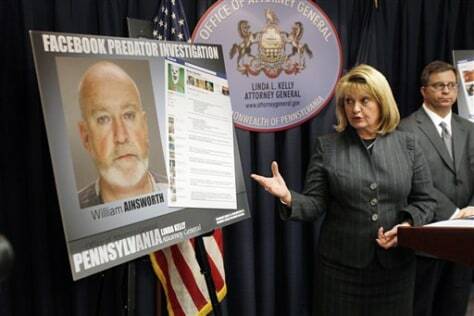 Pennsylvania Attorney General Linda Kelly points to a poster of William R. Ainsworth during a news conference Friday in Pittsburgh to elaborate on the charges Ainsworth faces. He is accused of using an elaborate scheme on Facebook to solicit sexually graphic messages and photos from teenage girls and arrange in-person meetings. William Caye, a senior deputy with the attorney general's child predator unit, is at right.